Rich and buttery, toffee-like hard candy. What can be more satisfying than a drop of this pure indulgence! When I first saw the name, it thought it read ‘Weather’s Original’. So I thought, oh okay, that’s a regular name, nothing special. 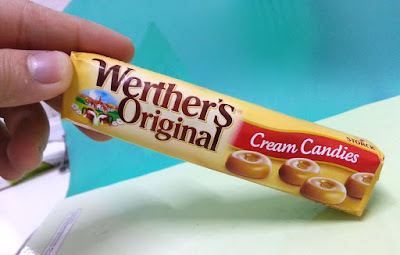 Upon closer inspection, I realized that it actually read ‘Werther’s Original’, as in Werther's with an R. Haha. Werther’s Original is a hard candy made by Storck, a German company specializing in all things confectionery. Ever heard of Merci chocolates, Riesen, Mamba, and Toffifee? That’s Storck. Originating in a little village called Werther (which was also where it got its name), this candy is the brainchild of Gustav Nebel, a confectioner with the recipe and patience that brought Werther’s Original to the attention of the world.